That was how, in a recent interview with Sky Sports, David Brooks described his emotions after being released by City aged 17. Brooks had been there for a decade and the realisation that he would not be offered professional terms threw his future into doubt. Four years on, however, and he is not just playing at the level he always strived for - but excelling at it too. Brooks has adapted seamlessly to the Premier League following his £11.5m arrival at Bournemouth from Sheffield United, starting all but two of their 15 games and helping them climb into the top half. 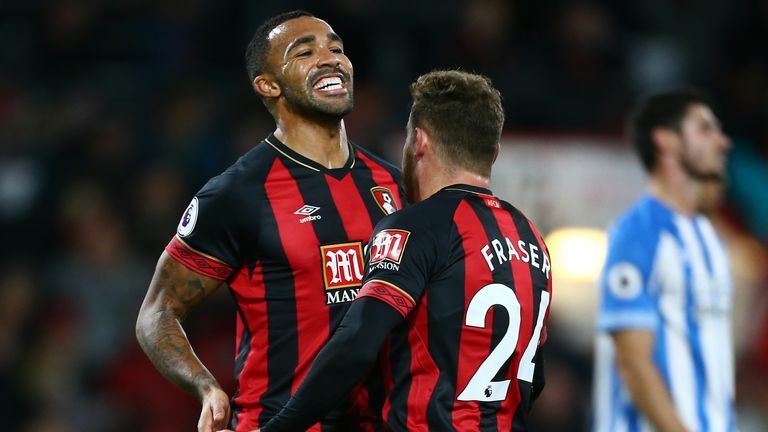 His vibrant displays from the right flank have yielded three goals, delighting Eddie Howe and earning him a reputation as one of the most exciting young players in the division. In the last few weeks alone, Brooks has faced Manchester United, Arsenal and his old club City either side of representing Wales. But there were times when all of this must have felt unimaginable. Brooks possessed no shortage of technical skill when he was cut loose by City in 2014, but his boyish 5ft 3ins frame put off every prospective club he went to. Even Sheffield United had their doubts. "He had some obvious qualities that wouldn't look too different from what you see in him now," Nick Cox, Sheffield United's academy manager at the time, tells Sky Sports. "So that's great awareness, good technique, good decision-making, composure on the ball. Those were the things that sprang out straight away. "The questions we had were around his physicality. He was two or three years behind in terms of his physical development. His shirt was hanging off him, his shorts were below his knees. He looked like a little boy. His ability to compete with boys of the same age was seriously impaired. It was about weighing up his qualities against the areas he needed help with." Sheffield United, a League One club at the time, eventually decided to gamble on him, taking on the remainder of the two-year scholarship he had signed with City a year earlier. It was a big moment for Brooks, who had doubted whether he would get another chance, but the real challenges were still to come. Could he adapt to grittier surroundings? "David made a brave decision to come to a football club which looked very, very different to Manchester City," says Cox, who is now academy operations manager at Manchester United. "It is a humble, industrial, hard-working, no-nonsense, no-frills football club. It offers brilliant development but is a heart-on-its-sleeve kind of place to be. His shirt was hanging off him, his shorts were below his knees. He looked like a little boy. "David always showed a determination to be the best player he could. However, we are all products of our environment. Manchester City's programme was there to produce Champions League footballers to play in a particular way. Sheffield United, at that time, were trying to produce players who could compete in League One or the Championship. "He had to adapt to a new set of expectations." Brooks' new reality was never starker than during the games he played for a Sheffield United U21 side in a local youth league at Bracken Moor stadium, home of Stocksbridge Park Steels. Back then, Brooks' opponents were not the Premier League's elite but Staveley Miners Welfare, Harworth Colliery and Handsworth Parramore. "David could play for our U18s in his first year with us, but in his second year he was too old for the youth team but not yet ready for the physical challenge of the U23s, so we had to find bespoke fixtures for him," says Cox. "It was a case of trying to find environments to suit his development. "Our decision was to put our U19s into an U21s league to show them a type of football that might complement the experience they'd had in the academy. David played in those games, on cold Wednesday nights with nobody watching against no-nonsense local kids who were hungry to win and improve. It was designed for players of David's needs." Sheffield United also tried to get Brooks games at international level - Cox recalls Travis Binnion, their head of player development at the time, bombarding officials from the English and Welsh youth set-ups with requests to come and watch him - and in 2015 there was a first taste of men's football with a short-term loan at Halifax Town in the National League. "We ended up taking three lads from Sheffield United and David was one of them," Neil Aspin, Halifax's manager at the time, tells Sky Sports. "When he turned up he looked like a schoolboy. He was so small and frail. "Nobody knew what he was going to be like, but I remember my assistant, Lee Nogan, taking him out for some finishing practice and coming back and saying, 'This lad has got great ability.'" The circumstances at Halifax were far from ideal for an inexperienced youngster like Brooks - the club's poor form would eventually cost Aspin his job - but with one goal in five appearances before he was sent back to Sheffield United, it was still an important step for him. "It is a difficult league to throw young lads into and we were under pressure to get results at the time, but having seen David train for the first time we were really confident that we could put him straight in," says Aspin, who was later rebuffed by Sheffield United in an attempt to take Brooks on loan for a second time at Gateshead. Why not add David Brooks to your team? "For a young lad at that age to have so much confidence and composure was impressive. He was composed on the ball and he could see a pass. He scored on his first start for us against Aldershot and we said straight away that he was going to be a really good player. As far as I'm concerned you didn't need to be a great judge of a footballer to see his potential." The fearlessness with which Brooks approached his loan spell at Halifax is familiar to Alan Knill, Chris Wilder's assistant at Sheffield United since his appointment at Bramall Lane in 2016. "We liked him from day one," Knill tells Sky Sports. "There was a youth team game just after me and Chris arrived. He played in that as a left-sided central midfielder, which he was originally down as, and there was just something about him. He could always do something where you would end up clapping. He was so good. We decided more or less there and then that we would bring him in to train with us." Brooks only made four first-team appearances during the Blades' promotion-winning 2016/17 campaign, three in the Checkatrade Trophy and one in the FA Cup, but he made a big impression in training - not just with his technical ability but his attitude, too. "He didn't play too much for us that season but just training with the pros and seeing their habits helped him grow as a player," says Knill. "We had a really good group - we still do - where it's not enough to just do a trick or get a shot off, it's about the other stuff as well. Brooksy had that work ethic and he was never fazed by his surroundings. "That's just him. As talented as he is, there is nothing big-time about him. Our kit man here is also a boxer and had his first fight in Sheffield recently. On a Wednesday evening, Brooksy travelled all the way up from Bournemouth to watch his mate fight, then travelled back on the same night. He's just a really good lad." Knill remembers Brooks' talent outweighing his physical shortcomings, but it was during that 2016/17 season that the youngster's body finally began to catch up. "We weren't too worried because he was only young, he had plenty of time, and he could look after himself on the pitch, but then all of a sudden he just grew. He came in one day and he didn't look far off six foot. It was ridiculous. He shot up and fortunately he kept that technical ability. "I can remember watching him one day in training at around that time. We didn't think he was particularly quick, but the next minute Chris and I are looking at each other saying, 'Oh my God, how quick is he?' The senior players reacted the same way." He just turned into an athlete all of a sudden. He just grew into his body. Sheffield United verbally agreed to allow Brooks to go on loan to Chesterfield at the end of that season, but his starring displays for England at the 2017 Toulon Tournament changed their minds. Brooks would go on to pledge his international future to Wales, but when he returned to Sheffield United that summer, it was clear he was ready to play. For Wilder and Knill, the only dilemma was where. "We had no idea, really, where to play him," says Knill. "He could play on the left side of midfield. We thought about using him at No 10 or out wide. But in the end we just said, 'Let's just let him go out there and play.' We thought he was so good that he would find a space and do his stuff. We gave him freedom and it worked really well." Brooks impressed right from the start of the 2017/18 Championship season but it wasn't until the memorable 4-2 win in the Steel City derby at Hillsbrough in September that he first gained broader recognition. Over a year on, an image of his impudent nutmeg on Sheffield Wednesday's Jack Hunt remains the pinned tweet on his Twitter account. "That moment summed him up, really," says Knill with a chuckle. "It was a massive game, the first derby in five years, but it didn't faze him one bit. He just went out there and played. He wasn't bothered by the atmosphere, by the occasion, by anything." Brooks missed a chunk of the season with glandular fever between December and February - Knill says it was no coincidence that Sheffield United's promotion bid faltered during that time - but by then it had already become clear that he was likely to move to a Premier League club sooner rather than later. "We played Leicester away in the FA Cup in February," says Knill. "Me and Chris were sat there watching Riyad Mahrez on one side and Brooksy on the other, and we both thought he wouldn't look out of place in that Leicester team. No fear, again, he just went out and played. There were loads of scouts there that night so we kind of knew he would be going." Among those scouts were representatives from Tottenham, Arsenal and Manchester United, but having seen his pathway blocked as a young lad at City, Brooks eventually decided to shun the Premier League's elite in favour of Bournemouth. "If he had gone to Tottenham or one of the other big clubs, the chances are he just wouldn't have played," says Knill. "I'll be honest and say none of us thought he would be playing every week in the Premier League like he is now, but we all thought Bournemouth would be a really good fit for him. He had been brilliant for us so we just wanted him to kick on again." Having honed his technical skills as a boy in City's academy, and having then been toughened up during those pivotal years in the lower leagues, Brooks is now showing the benefits of a broad footballing education. There is flair - the moments of skill that get fans out of their seats - but there is also hunger and intensity. "I think retrospectively you can say that, yes, he got all the ingredients he needed at the right times," says Cox. "Were those ingredients in place by design? No. It wasn't in the plan to leave Manchester City and go to Sheffield United, and I would be lying if I said it was a smooth journey and we always knew he would make it. But it worked out perfectly. "We can say he needed patience and time to allow nature to take its course. We can say he needed a manager to give him a chance in the first-team. But the major player in the development of David Brooks was David Brooks. He recovered from an enormous setback and took every opportunity he got. He showed commitment, perseverance and resilience and now he is getting his rewards." What's it like to work for Howe? Will Howe take a 'top job' offer? Watch Bournemouth v Liverpool live on Sky Sports Premier League HD from 11.30am on Saturday.